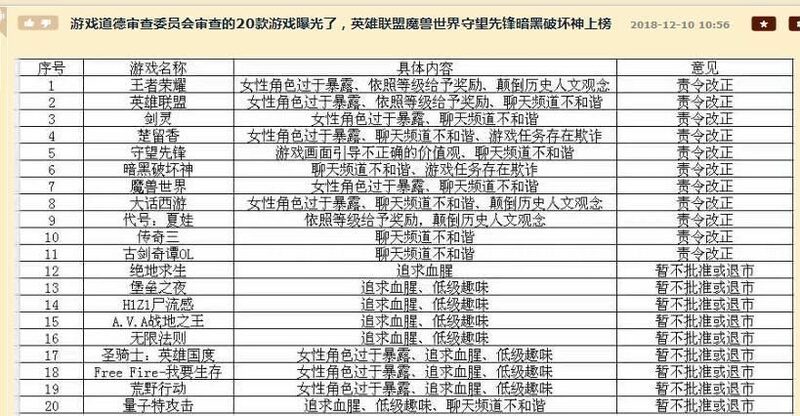 An unconfirmed list of 20 games banned in China by the Ethics Committee has surfaced on the Internet. Among them are also Fortnite and PUBG. Just a few days ago, we reported that a new ethics committee in China must now release games before they can be released in the country of the middle. This control mechanism has so far tested 20 titles and completely rejected nine of them . The other eleven have to be revised. Now a list has appeared that names the 20 titles. These include PUBG and Fortnite . This information comes from the Chinese game forum NGA. A translation provided the Reddit user ZeroWolfe547. Whether this list is real or not, but no one can confirm. The Chinese online community is unsure about its authenticity . Hi-Rez and Blizzard have commented on the information that has now surfaced. The publisher of Paladins points out to PCGamesN that Tencent is taking over the game and its operations in China. Therefore one can neither confirm nor deny the reports of a ban . Blizzard posted a post on his official Weibo account, a Chinese social media platform. There, the developer announced that they were not informed about measures against their own games . Meanwhile, this post has already been deleted. For nine months now no new game has been released in China . This condition is expected to continue for a while . To publish a game in China, the developers must follow the strict rules of the country. China-based publisher Tencent, the largest in the world, has now lost around $ 200 billion in value due to the suspension and the problems of monetizing its games under these strict rules . The establishment of the Ethics Committee should be a first step in allowing new games to be approved. In the past , Blizzard removed for a China release, for example, skulls and bones from World of Warcraft. An example that Ubisoft recently followed in an attempt to publish Rainbow Six: Siege in China . PES 2019 will no longer have the Champions League. A chance for FIFA 19 to shine?